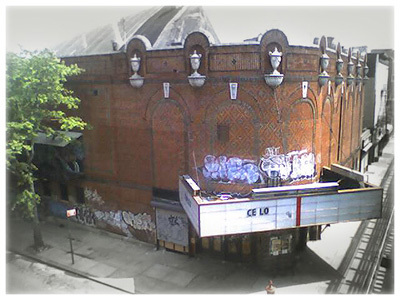 Above: The old movie theater that was at Rodney and Broadway in 2006 — sadly this palace was torn down during the real estate boom that followed, however in the immediate recession that followed no new building went up and is now an empty lot. This was the first blog that I ever started — and in 2006 both blogging and Williamsburg were new to me. After living in Manhattan for ten years I moved to the Burg in November of 2004 into a new world. Knowing that you should write about your passion I picked my new hood and combined it with my old interests. Some 200+ entries however this trip has come to an end. Fanboy.com: Where I do most of my nerd blogging. twitter.com/michaelpinto: My Twitter account where I often mention what I'm doing in Williamsburg. I'd like to thank all of the folks who supported me over the years: My friends on Flickr who encouraged me to document what I saw, the gallery owners who didn't mind me taking photos of their exhibits and the podcast Live from the WB which is now faded into history (but inspired me a great a deal). This page contains a single entry from the blog posted on November 24, 2009 9:36 PM. The previous post in this blog was An Illustration of the Recession in Williamsburg.